This ticket allows access to Reggae Sun Ska - 22nd edition on the 2nd, 3rd and 4th August 2019 in the Domaine de Nodris and to the official campsite. Free entry ONLY for kids between 0-10 years old. From 10 years old please ensure you purchase a ticket. This ticket allows access to Reggae Sun Ska on 2nd August 2019 in the Domaine de Nodris and to the official campsite. Free entry ONLY for kids between 0-10 years old. From 10 years old please ensure you purchase a ticket. This ticket allows access to Reggae Sun Ska on 3rd August 2019 in the Domaine de Nodris and to the official campsite. Free entry ONLY for kids between 0-10 years old. From 10 years old please ensure you purchase a ticket. This ticket give access to Reggae Sun Ska on 4th August 2019 in the Domaine de Nodris and to the official campsite. Free entry ONLY for kids between 0-10 years old. From 10 years old please ensure you purchase a ticket. Enjoy a new experience in a pre-pitched KarTent. A KarTent is a tent made entirely of cardboard; it has been designed to withstand rainy weather for 4 days. Compared to a traditional tent, it has several advantages: darkness in daylight and better insulation. What the Kartent offers: - Tent for 2 people *This ticket does not include the festival pass. **The booking fee are a deposit that will be totally refunded once the equipment condition is validated. A 100% natural cotton solution, completely waterproof to provide comfort come rain or shine. The integrated, high quality floor mats to enjoy a great night of sleep. 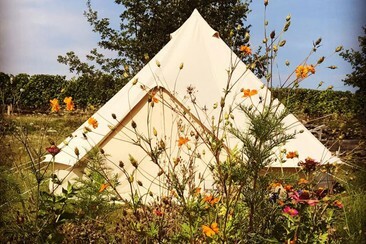 What the Tipi offers: - A space for 2 people - Comfortable foam mattresses. - A lamp - Comfort spaces the village Bed and Smile *This ticket does not include the festival pass. **The booking fee are a deposit that will be totally refunded once the equipment condition is validated. A 100% natural cotton solution, completely waterproof to provide comfort come rain or shine. The integrated, high quality floor mats to enjoy a great night of sleep. 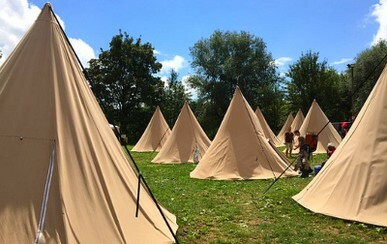 What the Tipi offers: - A space of 14m² for 5 people - 5 comfortable foam mattresses. - A lamp - Comfort spaces the village Bed and Smile *This ticket does not include the festival pass. **The booking fee are a deposit that will be totally refunded once the equipment condition is validated. 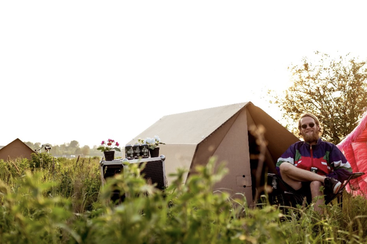 Enjoy a new experience in a pre-pitched KarTent. 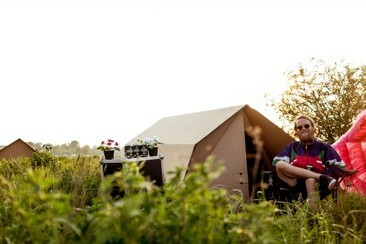 A KarTent is a tent made entirely of cardboard; it has been designed to withstand rainy weather for 4 days. Compared to a traditional tent, it has several advantages: darkness in daylight and better insulation. What the Kartent offers: - Tent for 2 people - 2 comfortable foam mattresses - A lamp - Comfort spaces in the village Bed and Smile *This ticket does not include the festival pass. **The booking fee are a deposit that will be totally refunded once the equipment condition is validated.